It is a new era for Scotland with Gregor Townsend coming in as head coach and having to revamp the team. Captain John Barclay, however, has brushed aside any suggestion the side are under extra pressure to start with a victory. “There’s always pressure to win; I don’t think there’s more because there’s a new coach,” he said. “I’m sure Gregor wouldn’t expect players to play just for him. You have enough to play for when you play for Scotland. It is hard to know just what to expect from either side before they take to the pitch at the Singapore National Stadium. Both have gone through significant changes since they last met in the final game of the RBS Six Nations Championship and are seeing the match as something of a fresh start. They have a lot in common, making nine changes from the Six Nations sides – the Lions and injuries forcing Townsend’s hand, while Conor O’Shea, the Italy coach, elected to leave his veterans behind and launch himself into a new era with a bunch of youngsters. “It is hard to analyse and predict what they are going to do, so we have focused on ourselves,” Barclay added. “We have a new coach, new systems, new calling structures. A lot is how we are going to go about our business rather than what they will bring. “It will be hot but we back ourselves fitness-wise to adapt to the conditions. We want to play fast rugby, we are not shy about saying that. “Everybody is trying to play fast but, in some ways, you can go away from that, go away from the way you are trying to play the game. The key thing is to do everything with speed. That battle at the breakdown, in which Barclay himself will be crucial, not just as a leader but as one of the key players, will make all the difference. If they let it degenerate into a forward slog, they may struggle, but should have more firepower if the ball is whizzing around. “We want to set the tempo of the game,” emphasised Dan McFarland, the forwards coach. “We train at a high pace. There is no room for sitting back and taking time. “Pace and tempo are things we do at training – we stress them harder at training. You want to win but, as far as I am concerned, if you play and win you still look for the things you can improve on. “We are confident in our ability and that what we can do will win. The Italians have gambled. 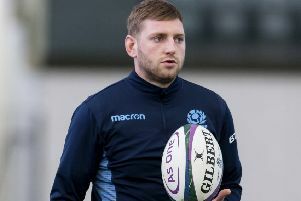 They left their veterans, including talisman Sergio Parisse, behind to rest and recuperate and have handed Scotland a significant advantage in terms of experience. That includes two new caps, though Dean Budd, the lock, is scarcely a newcomer having arrived in Italy five years ago from New Zealand and played regularly for Benetton Treviso in the meantime. “I never came over to play for Italy but it evolved as my passion for the country has grown,” he said. “I am in charge of the lineout but know a lot of the guys around me well, I don’t feel under extra pressure. “I know most of the Scottish players from playing against them, which helps with the comfort. After today’s game, the tour moves to Australia.